Yesterday's dance debut show went off beautifully. I love how organized the shows are for our dance studio. Workers in the wings to make sure everyone was in their right place. Parents in the dressing rooms for the little ones to make sure all the costume pieces are on right. A well-dressed emcee announcing all the pieces. I spent the pre-show time sewing snaps on the girls' ribbon chokers for their "Pirate" costume. I didn't realize that basic sewing is such a lost art, but I really enjoy being able to help. I like the other moms in our group. We're all new to the competitive dancing thing so we're all learning together what has to be done - like altering costumes, sharing make-up skills and double-sided tape, tying double-knots, and doing a frantic last minute repair for an anxious mama by sewing on a feather-thingy that popped off a hat. 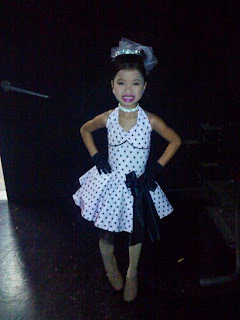 The petites team's first dance was a tap routine to Jump, Shout. I brought my good camera, but I didn't have a spare minute to pull it out of my bag and, you know, use it. I snapped a quick shot in the dark backstage before the show began with my cell phone camera. So it's not a great shot, but it does show a little of the costume for those who are curious. They did a great job, especially for their very first performance and they are so very cute. The moms raced out of the audience and back to the dressing room to strip off the pouffy pink dresses and switch to a colorful pirate costume. (Well, actually a few are doing duets and they had an extra costume change, but I decided that L needed to ease into the whole competition thing, so, no duet this year.) I did a *little* better and remembered to get a picture in the well-lit dressing room, but it was still a quick thing with the cell phone. She's a tough angry pirate. 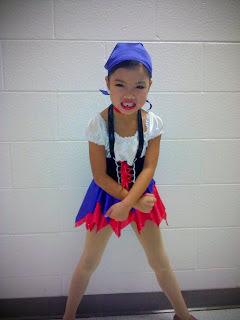 The petites (8 girls, 1 boy) did a very cute jazz routine to "The Pirates Who Don't Do Anything" and they played the part of grumpy pirates to the hilt. They stalked on stage, elbowed each other, glowered at the audience, one threw a fit, and just generally had so much fun. They were hilarious! At the end, they all whirled off stage and then, all alone, L skipped back to stage center, struck a pose, shook her finger at the laughing audience, and skipped back off. It was the perfect dance for a group of fun-loving, high-energy little kids. We have a little over a month until our first competition. As smoothly as everything went Saturday, I think it'll be a good experience this year. And L had so much fun with the whole thing. She spent the last 2 weeks declaring that she couldn't wait for the Debut Show. Saturday morning, she was incredibly anxious to get to the auditorium, and she spent every minute before and after the show doing tap steps out of excitement. She tapped through the store, tapped down the halls, tapped up and down the sidewalk, tapped while waiting for the pizza. She's going to be sad to have to wait a whole month and more until the next performance. Oh well, she still has 5 classes a week to keep her toes busy and I'm sure they'll be tweaking the dances between now and then, so they'll be even better at the next show.